Oriented Strand Board (OSB) is a widely used, versatile structural wood panel. OSB makes efficient use of forest resources, by employing less valuable, fast-growing species. OSB is made from abundant, small diameter poplar and aspen trees to produce an economical structural panel. The manufacturing process can make use of crooked, knotty and deformed trees which would not otherwise have commercial value, thereby maximizing forest utilization. OSB has the ability to provide structural performance advantages, an important component of the building envelope and cost savings. OSB is a dimensionally stable wood-based panel that has the ability to resist delamination and warping. OSB can also resist racking and shape distortion when subjected to wind and seismic loadings. OSB panels are light in weight and easy to handle and install. 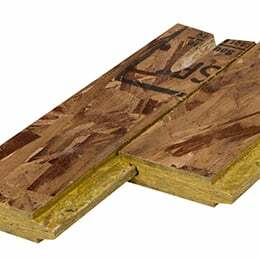 OSB panels are primarily used in dry service conditions as roof, wall and floor sheathing, and act as key structural components for resisting lateral loads in diaphragms and shearwalls. OSB is also used as the web material for some types of prefabricated wood I-joists and the skin material for structural insulated panels. OSB can also be used in siding, soffit, floor underlayment and subfloor applications. Some specialty OSB products are made for siding and for concrete formwork, although OSB is not commonly treated using preservatives. OSB has many interleaved layers which provide the panel with good nail and screw holding properties. Fasteners can be driven as close as 6 mm (1/4 in) from the panel edge without risk of splitting or breaking out. OSB is a structural mat-formed panel product that is made from thin strands of aspen or poplar, sliced from small diameter roundwood logs or blocks, and bonded together with a waterproof phenolic adhesive that is cured under heat and pressure. OSB is also manufactured using the southern yellow pine species in the United States. Other species, such as birch, maple or sweetgum can also be used in limited quantities during manufacture. OSB is manufactured with the surface layer strands aligned in the long panel direction, while the inner layers have random or cross alignment. Similar to plywood, OSB is stronger along the long axis compared to the narrow axis. This random or cross orientation of the strands and wafers results in a structural engineered wood panel with consistent stiffness and strength properties, as well as dimensional stability. It is also possible to produce directionally-specific strength properties by adjusting the orientation of strand or wafer layers. The wafers or strands used in the manufacture of OSB are generally up to 150 mm (6 in) long in the grain direction, 25 mm (1 in) wide and less than 1 mm (1/32″) in thickness. In Canada, OSB panels are manufactured to meet the requirements of the CSA O325 standard. This standard sets performance ratings for specific end uses such as floor, roof and wall sheathing in light-frame wood construction. Sheathing conforming to CSA O325 is referenced in Part 9 of the National Building Code of Canada (NBC). In addition, design values for OSB construction sheathing are listed in CSA O86, allowing for engineering design of roof sheathing, wall sheathing and floor sheathing using OSB conforming to CSA O325. OSB panels are manufactured in both imperial and metric sizes, and are either square-edged or tongue-and-grooved on the long edges for panels 15 mm (19/32 in) and thicker. For more information on available sizes of OSB panel, refer to the document below.